I couldn’t believe it when I saw that a Trolls movie coming to theaters several months ago. I remember owning a Trolls keychain growing up and being so upset when I it was lost. Now they are back and cuter than ever! The kids came home raving about the Trolls movie after seeing it in the theater. As soon as it become available on DVD, I ordered it so we could all watch it together. We love to do themed movie nights, so I turned to Pinterest for some fun Trolls inspired ideas and found so many great ideas. Whether you are planning to get comfy and watch Trolls with family and friends or throw super fun Trolls birthday party, there are some great ideas for you. Just like the movie, this Trolls Movie Inspired Fruit Punch Recipe from Our Family World is full of color. This colorful and easy Troll Party Snack Mix from Craft Create Cook will be the perfect addition to your Trolls movie night or birthday party. Transform an easy and familiar favorite into Trolls Puppy Chow. These Trolls Cupcakes from Craft Create Cook are so cute and fun! This is Trolls Movie Inspired Candy Bark from Southern Family Fun is colorful, sparkly, and whimsical just like the movie. These Trolls Cupcakes were found on Pinterest with no directions, but they look pretty easy to make with icing. Kids will love all the icing on these Trolls Cupcakes from Craft Create Cook. You’ll be able to whip up these Poppy Pink Strawberry Trolls Cookies from Sippy Cup Mom quickly for your Trolls party or movie night using a cake mix. Glitter Cake Pops from Practical Mommy are another fun, colorful, and sparkly Trolls inspired treat. How fun are these DIY Trolls Headbands from DIY Inspired! These would make a great favor or craft project for your Trolls birthday party. This Trolls inspired headband from Clementine County may not have as much wow factor as the previous one, but it looks super easy to make. These Trolls Inspired decorations were found on Pinterest. You need a terra cotta pot, chenille stems, package paper flowers, ribbon, and adhesive spray to stick. You can find directions in the comments on the pin. The cloud guy has a small part in the movie, but this Paper Plate Cloud Guy from The Pinterest Parent is so fun. Every party needs games and activities. 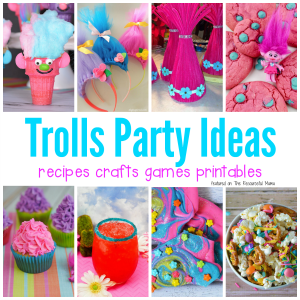 Check out these fun filled Trolls Party Games and Activities from Val Event Gal. Great Kids Birthday Parties has lots of Trolls printables: invitations, thank you tags, water bottle labels, thank you stickers, bracelets, and headbands. Craft Create Cook has a really fun Trolls inspired favor bag that girls will love! Print a really cute bag topper for your Trolls inspired favor bags. These printable Troll Cupcake Liners from Val Event Gal are a quick and easy way to transform your cupcakes and make them party ready. Grab these printable Trolls invitations and cupcake liners for your party from Musing of an Average Mom. I really liked all these ideas, Unique and artistically made. Such fab ideas! Wondering what to do for my daughter’s fourth and this will definitely help! Thanks for sharing! You are welcome Elly! Hope you find some great ideas!